Chances are you want to sound MORE like a native English speaker! After all, improving your accent can help you feel more confident when speaking because you know that the focus is going to be on your words, not the way you say them. On top of that, speaking with a more natural-sounding accent may help you fit in better with Americans or other English speakers. My clients often say that they want to reduce their accent because it can feel like a distraction. We can’t help it: when we hear a non native accent in any language, we generally become quite curious about where the person’s from. While there is absolutely nothing wrong with having a non-native accent, you probably wouldn’t be here if you didn’t care about improving how you sound in English. Now, I could sit here and give you a number of suggestions about exactly what you need to do to sound more like a native English speaker. But then you’d probably just add those things on to your to-do list of things that you’re going to work on someday, and then move on and probably forget about it. Instead, I want to turn this idea around. I want to tell you how NOT to sound like a native English speaker. This way you’ll think about whether you’re making these mistakes and make a decision on whether or not you want to work on them. As we talk about these seven ways to NOT sound like a native English speaker. I want you to think critically about your accent and your speaking habits. When I evaluate non-native speakers during accent assessments, or meet with new clients, or even just give quick tips, these mistakes are what I’m listening for. In other words, these speaking habits that I’m about to describe identify you as a non-native English speaker. You’ve probably noticed that my articles and videos are positive and encouraging, but at times it’s important to be honest with ourselves about what we’re doing wrong. As a non-native Spanish speaker, I have really appreciated when people have taken the time to clarify what I’m doing wrong, instead of simply telling me that I sound like an American when I speak Spanish. So let’s get started with how not to sound like a native speaker. #1: Pronounce each and every syllable with exactly the same length, pitch and volume. If you don’t want to sound like a native English speaker, then you should say each syllable with exactly the same emphasis. We stress certain syllables in words by lengthening the vowel sound, increasing our volume, and changing the pitch. This contrast between stressed and unstressed syllables is absolutely required for a native-sounding accent. If you pronounce each and every syllable with exactly the same length, your speech may sound choppy or even robotic, and it will be harder for a native English speaker to follow what you’re saying. If you’re interested in improving your syllable stress, check out my article and video on Word Stress in American English. You can start practicing right away with my Stress Simplified program. #2: Speak without pausing between ideas. If you’re not interested in speaking English more naturally, then you can speak without pausing at all between ideas. Native English speakers pause to take a breath at the end of their sentences. We also pause briefly or change our tone between ideas in order to separate them into thought groups. We chunk our ideas into smaller pieces by pausing in logical places. This gives our listeners a chance to consider what we’ve said, and also helps us to emphasize certain words and certain points. If you don’t want to sound like a native English speaker, then you don’t have to pause between your ideas. If you want more guidance on how to improve how you speak, check out Seven Ways to Use Your Voice and Breath to Sound More Professional in English. A clear indicator that you’re not a native English speaker is when you don’t use contractions. Native speakers often use contractions in order to move more quickly through less important words, such as pronouns and auxiliary, or helping, verbs. This helps our sentences flow more naturally, and also focuses attention on the words that truly matter. Many non-native speakers struggle to use contractions consistently because they’re taught that this is informal language, but it’s not. Contractions are a regular part of everyday speech in all kinds of situations. When you choose not to use contractions, you’re often putting extra emphasis on the wrong words, which can confuse the person who’s listening to you. So if that’s your goal, then continue to not use contractions. Learning to use contractions consistently is one of the top five ways you can sound more natural in English. Sign up for the free email course here. #4: Pronounce all of the -ed endings exactly the same. To sound less like a native English speaker, you want to pronounce the -ed ending on past tense verbs and participial adjectives, or -ed adjectives, as /əd/ all of the time. Native speakers will actually vary the pronunciation of the -ed ending based on the sound that comes before it. By pronouncing the -ed ending as follows: as the “t” sound or /t/ after voiceless sounds, the “d” sound or /d/ after voiced sounds, and the “əd” sound after the “t” or “d” sounds, we’re actually speaking more efficiently. We change the pronunciation of the -ed ending, so that we have to do less work with our mouths. But if you like doing more work and adding the /əd/ sound to every single past tense verb, then keep on going. Learn how to pronounce the -ed ending like a native speaker on past tense verbs by paying attention to how the word sounds. #5: Pronounce vowel sounds without moving your mouth. You’ve probably noticed that there’s a lot of variation between vowel sounds across languages. If you’re pronouncing vowels exactly the same way as you do in your native language, then you probably don’t sound like an American – mission accomplished! Americans in particular tend to move their mouths quite a lot when pronouncing vowel sounds. Specifically, when we say long vowel sounds and diphthongs like /ey/, /iy/, /ai/, /ow/, /uw/, /oi/, /ou/, and so on, we move our mouths in order to form the sounds, and especially at the end of the vowel sound. This vowel shaping at the end of words like “day,” “boy,” “sky,” “new” will help you correctly lengthen the vowel sound and pronounce it more like a native English speaker. But if you feel like moving your mouth at the end of these sounds is too much work, then don’t worry. You won’t sound like a native English speaker and that’s what we’re talking about today: that’s the point, right? Learning to create the right shape at the end of long vowels and diphthongs will help you sound more American, and it’s easier than you think! #6: Use reductions and informal contractions without correctly stressing the rest of the sentence. In fact, you may have started to say them already because they’re so fun to practice. However, these reductions and informal contractions are a result of English rhythm: they occur because of how we stress content words and reduce function words. Once again, these reductions and informal contractions are a more efficient way to speak. If you’re not consistently stressing the rest of the sentence, then throwing in one of these informal contractions will sound out of place and super obvious. If that’s your goal, then great, you won’t sound like a native English speaker. But if you do want to sound more like a native speaker when using these informal contractions, then I have a video for you to practice with right here. #7: End your sentences without thinking about whether your pitch rises or falls. If you’re not considering how your pitch rises and falls throughout your speech, but especially at the end of your sentences, then you probably don’t sound like a native speaker. This rise and fall in pitch, or intonation, gives extra meaning to our sentences, and it can be used to express a wide variety of emotions. Most simply, we use falling intonation at the end of our sentences when we complete a thought or ask an information question. In addition, we use rising intonation when we ask a yes/no question or we’re checking or confirming our understanding. This rise or fall occurs at the end of the sentence and signals to the person who’s listening to us whether we’ve completed our thoughts, or if we’re asking a question. To sound more like a native English speaker, you want to have more control over your pitch so that you can communicate how you feel. But if this doesn’t matter to you, then don’t worry about it. Compare how we use rising and falling intonation on statements and questions and learn how to choose the right intonation pattern. Now that we’ve talked about seven ways to not sound like a native English speaker, I want you to think about whether or not you’re making any of these mistakes. If so, be sure to check out the links I’ve included throughout this article! Remember, my goal truly is to help you sound more like a native English speaker, so that you can feel more confident when speaking English. Next, I’d love to hear from you. Can you think of any other examples of how not to sound like a native speaker? Leave a comment and let me know: your suggestions may end up inspiring another video! Ready to start working on these accent mistakes? 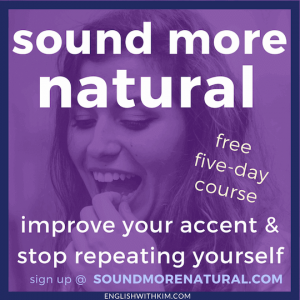 Get started with my free email course: Sound More Natural in English in Just Five Days!